Younger students can have difficulty logging in to computers, especially if they don't have prior experience with computers. 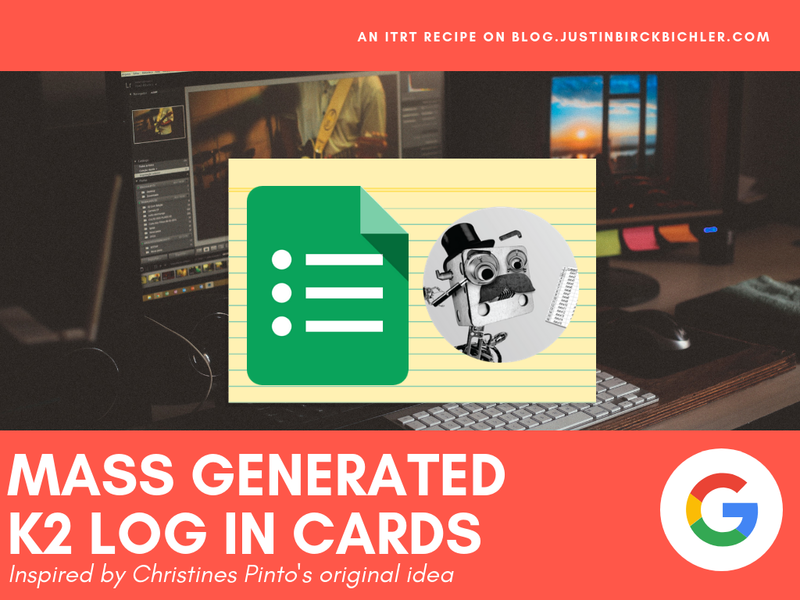 By using a modified version of Christine Pinto's template, you can create a bunch of cards at one time. Be sure that usernames and passwords are on two different sheets within your Excel spreadsheet. On your usernames tab, navigate to Data --> Text to Columns. Choose Fixed Width --> Next. Click between each character to draw a line. Hit Finish. Repeat this on the passwords tab. On 'To Merge' Template, input students' first and last names. From your Excel sheet, copy character-separated usernames and paste them into the Google Sheet in the cells entitled "un1 to un19". Repeat this for passwords in the cells "pw1-pw5." Add or subtract cells as needed, and be sure to update any changes on your Autocrat template. Install/run AutoCrat in your 'To Merge' Template. For explicit directions on AutoCrat, click here for an overview or watch the video directions below. Open one of the newly-minted sheets. Install/run the CombineSheets add on. Combine all of the Sheets you just created. Open the same Sheet from step nine. Click the down arrow on the tab and choose 'Copy to...' the new Sheet you created in step 9. Use the format painter to 'grab' the format from the new tab. Apply it to the entire sheet. Print and (laminate, if desired). Color code your keys according to the directions in Christine Pinto's original blog post. Show your students how the colors on their cards correspond to the keys on the keyboard. Looking to access the PSA immediately? Click here to watch the video. Part of being a fourth grade teacher (my full-time job for the past five years) is the dreaded end-of-year “your body is going to start changing” talk. While I spend lots of my free time outside of school being an advocate for testicular cancer awareness through my blog A Ballsy Sense of Tumor, I don't often talk about testicles with my students. In my opinion, these passing mentions are not nearly enough. Doctors recommend that both testicular and breast self-examinations are done once per month when full physical maturity is reached. For some students, this could be as young as fifteen years old. During their eleventh and twelfth grade years, Virginia students are not exposed to any information about the importance of self-examinations, which is when most students will have reached full maturity. The current standards were, in my opinion, not enough. It’s unrealistic to expect students to form the habit of regular self-exams based on one passing mention in ninth grade. This reality is even more alarming when paired with a 2016 study by the Testicular Cancer Society that found over 60% of young men have never been told about testicular cancer. Something needed to be done. As a man of action, I decided to write to the Virginia Department of Education (VDOE) to express my concerns and to work with them on a solution. Within a few weeks, Vanessa Wigand, the VDOE Coordinator of Health Education, Driver Education, Physical Education & Athletics, emailed me back. She suggested that I script and star in an instructional video about testicular cancer and the importance of self-exams. Furthermore, she suggested having high school film department students film, edit, and produce the video. I loved that idea, especially the part about having high school students assist, as they are a part of the target demographic I’m trying to reach. Around the same time as my discussion with Vanessa, I was at an EdTechTeam Apple Conference, and attended a session by Steven Knight, the Coordinator of Digital Learning for Falls Church City Schools. Since his presentation was all about video production, I approached him about having his students help produce the video. He loved the idea and later shared that he is also a cancer survivor. With the technical side of things locked down, I began to work on the script the self-exam video. With the help of my sister, a high school senior, I polled some high school students and asked them what they’d want in a self-check video.According to the results, they’d like something that included a blend of humor, serious information, personal stories, and a how-to. I kept these recommendations in mind as I wrote the script. I knew that my story wouldn’t necessarily be the most relevant to high schoolers, since I am ridiculously old compared to them. I needed someone their own age to share his story, so I reached out to Grant Moseley, a current high school senior and testicular cancer survivor who was diagnosed at 17. He agreed to write and share his story. In early April, which is also testicular cancer awareness month, I filmed my sections, including my own story, information about testicular cancer, and narrating an animated self-exam demonstration, at George Mason High School under the direction of Steven, Kenneth George (the school’s film teacher,) and his high school student film crew. Beyond the coolness factor of being on camera, I loved seeing the three male students show expressions of intrigue while I shared some facts about testicular cancer. Later, when I spoke with one of the students, he said he had previously heard about testicular cancer but never knew exactly how to do a self-exam before filming. Mission accomplished. Full disclosure - while I had my lines totally memorized well in advance, I messed up about 384 times while filming. Something about having two cameras on you is intimidating, but I felt confident in my final takes and in the editing skills of the students. My faith in them was rewarded - they actually made me look good! Rather than tell you about their awesome work, I’m embedding the final product below (or watch it directly on YouTube here). While it is 11 minutes long (practically decades in this era of YouTube), it’s well worth the watch! I had a chance to debut the video at the Virginia Health and Physical Activity Institute. In two sessions, I provided statistics, tips, and other information about testicular cancer to a number of health educators and curriculum coordinators. The attendees seemed to enjoy the video and especially liked that it was a comprehensive resource that covered all the bases, with a great blend of personal stories, information, school-appropriate humor, and an animated self-exam demo. Many eagerly asked where it would be located so that they can use it in their own districts. Vanessa happened to be in the session and said that the video is posted on Health Smart Virginia, which is an online depository of lesson resources. To access it and other resources, visit this link and select "Health Smart VA Lesson Plans" under "Health Promotion." Scroll to Unit 27 - Grade 9 - Testicular Cancer 101 Video. These resources are also located in similar places in Grade 10, but it's the same information either way. She also said she will send it directly to all health curriculum coordinators across the state, which will hopefully help the video become regular viewing material for all high school grades. While I am honored to have made an impact on Virginia’s curriculum, I always want to have as big of a reach as possible when it comes to testicular cancer awareness. In the 50 states of the US (and Washington, DC), only 18 states make a specific mention of testicular self checks in their mandated health curriculums. Of these 18, only two states (California and Washington) include standards that address how to do a self exam in grades 9-12. Consult the map below to see if your state made the cut or not. If your state has room to grow, please send this blog post or the link to this educational site (which is also posted on Health Smart Virginia) to the relevant parties in your state. I personally plan on reaching out to the “Vanessas” of each state in hopes to make this a national project. In closing, I would like to offer a sincere thank you to all of those who helped support this project, including Vanessa and the VDOE, Grant Moseley, the Moseley family, Eric Manneschmidt (who filmed and edited Grant’s section), Steven Knight, Kenneth George, the high school film students, my colleagues at school who helped review my script, and countless others. This was truly a collaborative project. We put forth the effort to produce this video, and now the ball is in your court to watch and share this video. As I said in the closing of the video, together, we can get the ball rolling on discussing the importance of testicular self-exams. 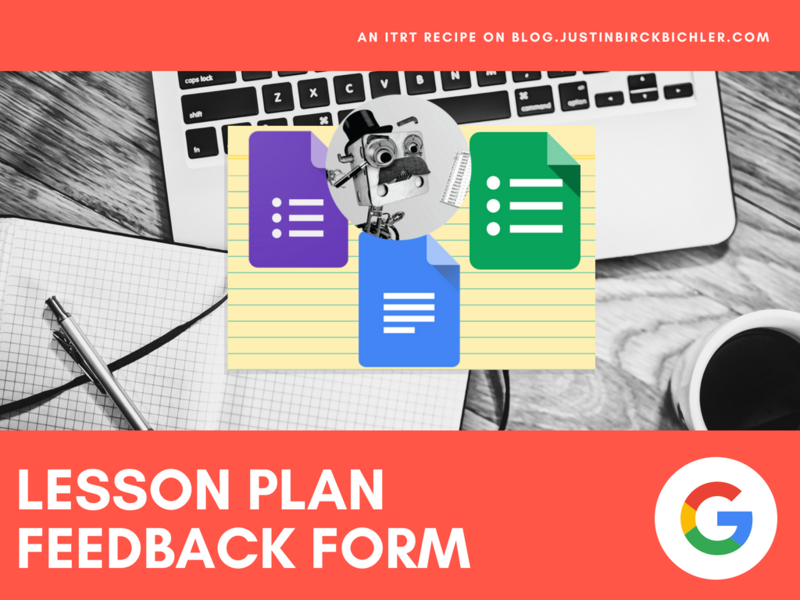 Provide feedback to your teachers on lesson plans (or anything else you'd like)! Administrators and coaches, pick your path - intermediate or advanced - to provide automatic and personalized feedback to your teachers. Create a Google Form that addresses all the area you wish to give feedback on. For this example, my admin wanted to be able to address Teacher Name, Date, Subject Area, Standard Present in Lesson Plan, Learning Intentions/Success Criteria, and Required Lesson Plan Elements (Flow, Opportunities to Respond, Student Engagement Strategies, and Feedback). If you are following the Intermediate directions, also include a textbox for teacher email. If following the Advanced directions, you will set this up to run automatically in step 6. Using the FormValues Add on for Forms can help if you will be using the same values in Forms over and over. In this case, I used it for teacher name. From the responses tab, create a spreadsheet of responses. Open the Sheet. Create a new Google Doc and title it 'Lesson Plan Feedback Template' or something similar. Create a template using the column headers from the Google Sheets within merge tags, which look like this: << and >>. This will help with Autocrat in step 7. For the "demographic information," I used two column tables - left containing the prompt (Teacher Name) and right containing the tag for Form response (<<Teacher Name>>). Go to your Sheet from step 2. OPTIONAL, ADVANCED STEPS. IF CHOOSING NOT TO DO THESE, SKIP TO STEP 7. This step allows you to automatically insert emails and specific folder placements. It takes time on the front end, but will end up saving you (and your teachers) lots of time and organization in the long run. Go to your Google Drive and set up individual folders for each teacher that you'll be providing feedback to. Add a new page to the Sheet you opened in step 5. In column A, put the teachers' names as they appear in the Form. Column B should contain their email addresses. In Column C, cut and paste the folder ID in for each teacher. The folder ID is a long string of characters after /folder/ in the Google Drive URL. They all look similar to "1P6euIGuXwTiBb4NS40ykzpBR3yc1qsSN"
Back in the first page of the Sheet, add two columns - one titled Email and one titled Folder Reference. Install/open the Copy Down Add on. It will prompt you to place the following formulas in a row it will create for you. In the new row, in both columns for Email and Folder reference, you will be writing a =VLOOKUP formula. It will look similar to =VLOOKUP(C3,Sheet2!$A$1:$B$45,2,false). Sheets does an ok job of guiding you what to type in and the optional video directions will explain this more. After you've done all this, you can join the rest of the class in step 7, and be sure to follow the optional, advanced directions in step 8, so all of your hard work pays off. To be fair, I did warn you that these were Advanced. Install/open the AutoCrat Add on. Run through the steps, using the template you created in step 3. If you set up the template in step 4 correctly, it should be easy, with just a lot of clicking through screens. Click here for an overview of the different Autocrat screens. If following the basic directions, you can entirely skip screen 6. OPTIONAL, ADVANCED STEPS. IF CHOOSING NOT TO DO THESE, SKIP TO STEP 9. You must set up screen 6 if you have chosen the advanced path. The above tutorial explains how to do it. See, that wasn't too terrible! At the end, choose Save. Depending on what you chose for triggers, once you begin using the Form, the Feedback Docs will be created instantly, on certain time triggers, or run manually. Bookmark the viewable Google Form somewhere in your bookmarks bar. Do your observation/feedback for the lesson plan/instruction in the Google Form. If you have followed the intermediate directions, the teachers will get an email with your feedback. If you have followed the advanced directions, they will receive an email AND it will be filed in their individual folder. When you have a lot of data to sort through, a pivot table may be your solution. 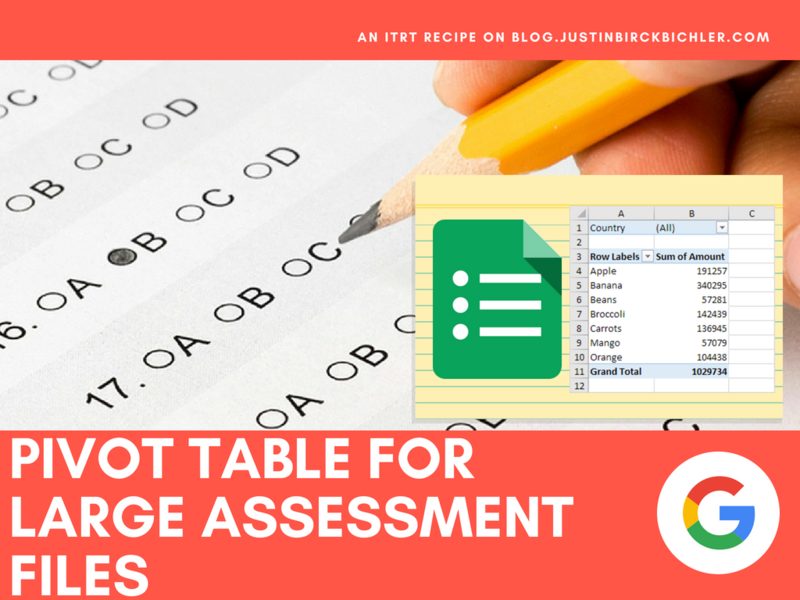 This recipe would be best for administrators or coaches who have access to building/grade level data, since a typical classroom teacher may not have hundreds of rows of data, which is the value of a pivot table. Beginner - I promise that pivot tables sound scarier than they are. Open your Sheet of data. Along the menu bar, go to Data --> Pivot Table. This will create a new tab on your sheet and open the Pivot Table Editor menu. In Rows, Add the data you want to sort. In this example, I used 'Item Description' so we could see all the type of questions. In Columns, Add the 'qualifiers' that you want to count by. In this example, I used 'Correct/Incorrect,' but you can have multiple columns that will nest in each other. Use this Pivot table to see areas of strength and weakness. Add in a column with a formula to calculate the percentage correct or incorrect to make it easier. Develop a paperless classroom sign-out system with Google Forms and CheckItOut. Keep track of who is where, without the hassle of tracking down tons of sheets of paper. Create a new Google Form. Delete the first automatically generated question. Select 'Add New' and retitle 'Check in/out set name' as "Students" or something similar. Add a list of student names into the first new question CheckItOut generated. Set up the viewable Form on a dedicated device or generate a short link/QR code that links to it. Depending what you chose in step 8, place this device/short link/QR near an easily accessible place. When students sign out, they select their name in the first drop down. When they return, they select their name in the second drop down. They don't need to add time or date, since Google Forms will do this automatically. Go to the Responses tab in the edit screen of Google Forms to see this information. 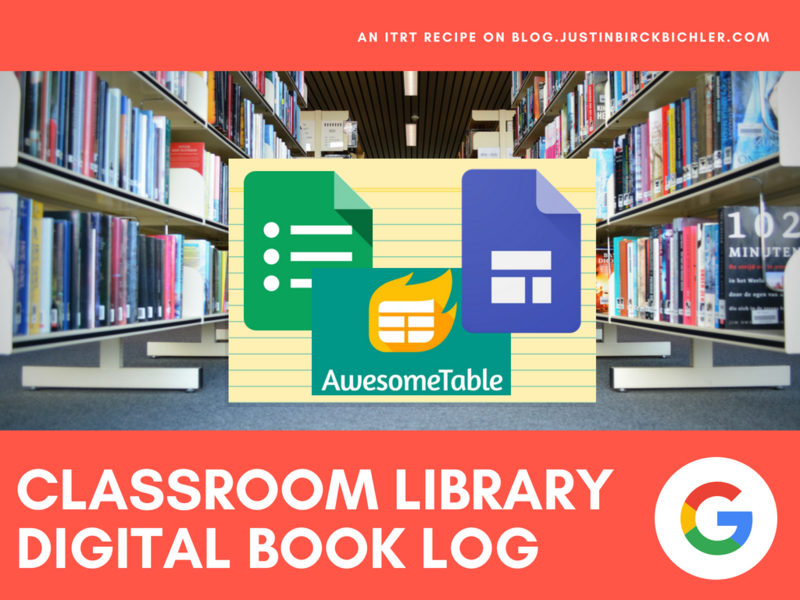 A continuation from Classroom Library Digital Check-Out System, this recipe will teach you to make a book log for your students. A great way for students to track their independent reading, in addition to keep accountability! 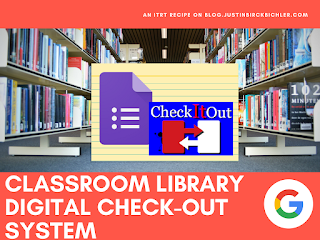 Be sure to already have your Classroom Library Digital Check-Out System set up and ready to go. If you have not already embedded it into a Google Site, do so now. From the responses tab in the Check-Out Form, create a Sheet of responses. Right click on the the '1' vertical axis to add a row under the row. Use the View menu to Freeze rows 1 and 2. Type 'CategoryFilter' in cells B2, C2, and D2. Type 'Hidden' in cells E2 and F2. Go to Awesome-Table.com. Sign in with whatever Google account is linked to this sheet. If necessary, press the pencil icon to get into editing mode. Assuming everything was set up correctly in step 4, there shouldn't be much you need to edit. Double check by click on the various drop downs. Click the share button (it kind of looks like a triangle that is missing a side). Copy the "Link to Share." 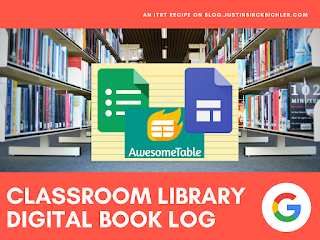 Go to your Google Site and create a page for the book log. Press Publish on your Google Site. Direct them to the page that has the book log. Show them how they can see their own book log page or other students' pages. This will help them track their own reading, in addition to get recommendations and check on the status of books from other. 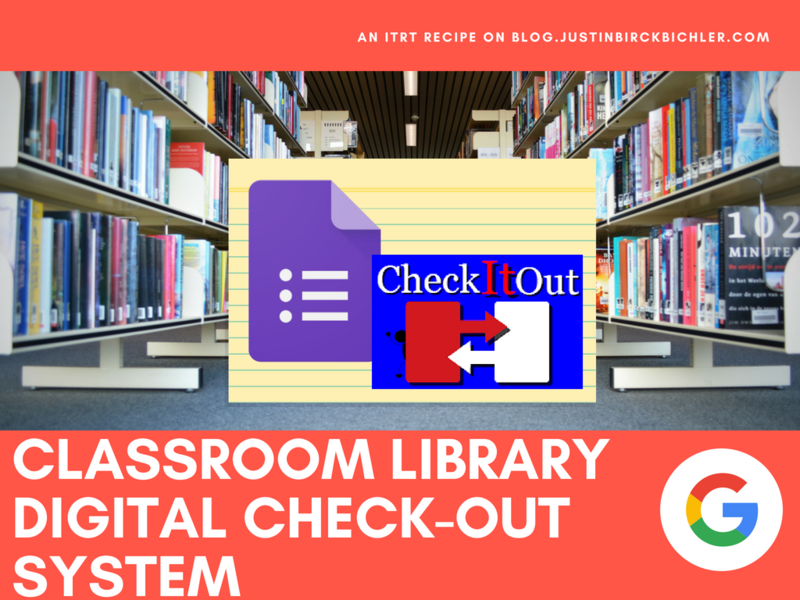 Looking for a paperless classroom library check-out system, without QR/Bar Codes? 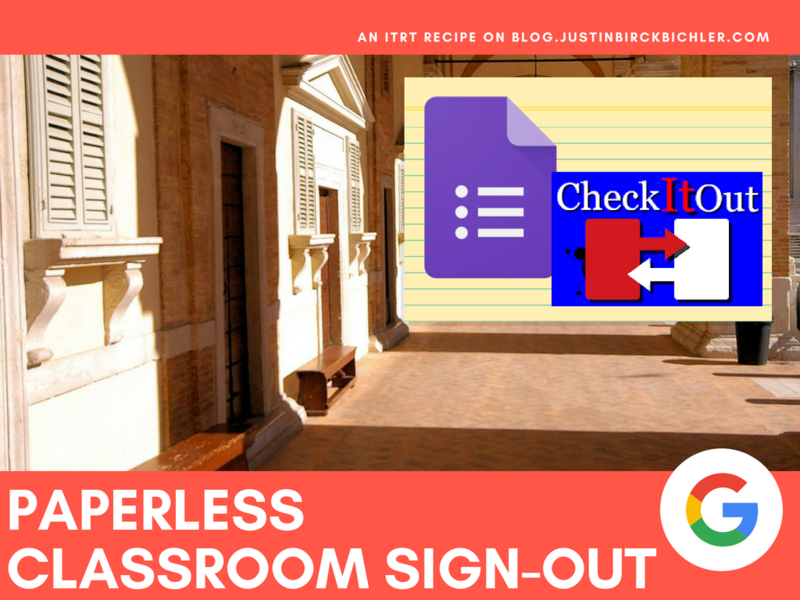 Using Google Forms and an add-on, you can easily create this user-friendly system. Make a copy of the Google Form Template from the Ingredients (or from here). Make the form as decorative as you'd like. Add, edit, or remove any questions you would like. Be sure to fill in your class list in student name and edit/add the genres you want. Select 'Add New' and retitle 'Check in/out set name' as "Book" or something similar. If desired, move 'Author Name' and 'Genre' below the two questions CheckItOut added. OPTIONAL - Embed the Google Form into a Google Site. (This optional step will help if you choose to make the 'Reading Log' public later - directions here). Use a Link Shortener to shorten the Google Form (or Google Site) URL. Alternatively, link to it from your Google Classroom or class website. Direct them to the check out form (wherever you placed it in step 9). They can select their name and genre from the drop down list. They must also type in author name.